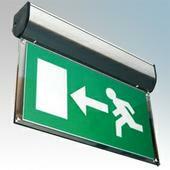 The Forest Self Contained Emergency Exit sign from Channel incorporates long life LED technology and also benefits from the inclusion of a 'self-test' facility. This unit, with its chrome finish, can be either surface mounted or suspended and a and a chain is included with each unit to facilitate ease of installation. 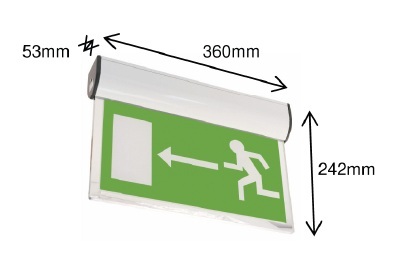 An even distribution of light across the entire surface is ensured by the use of an 8mm sign blade, supplied as standard with each Forest unit. The Forest range is available is several finishes and various accessories are available including a full range of legends and mounting brackets to suit each available finish. The Forest units perform a 'Self Test' as per the following schedule. 20 hours after applying mains voltage a function test will run automatically. This test will check the emergency changeover and the lamp operation. After a further 4 hours an automatic 2 hour duration test is run. If the test button is pressed for 5 seconds during this test the test will abort. After the initial duration test the weekly function test and the annual duration test are automatically started.